The Marine Corps’ ongoing reduction in forces means many things to our readers — including fewer promotion opportunities in many military occupational specialties and expanded incentive programs to leave the service. This week’s Marine Corps Times weighs in on both of those issues. 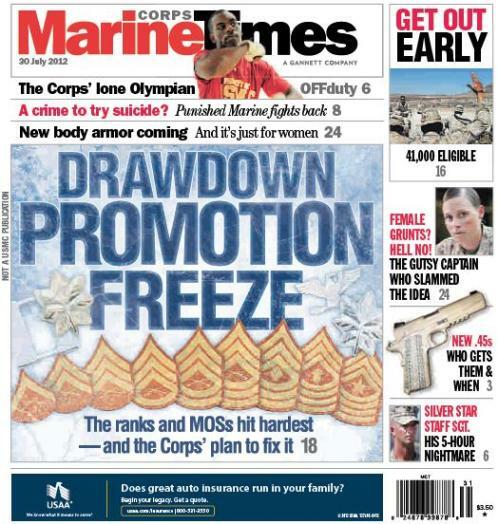 The main cover story outlines the ranks and jobs where the Corps’ promotion system is jammed up, and what the service is doing to fix it. We also lay out the details in the fiscal 2013 version of the Voluntary Enlisted Early Release Program, which will allow eligible enlisted Marines to leave the service up to a year ahead of their scheduled exit date. Also in this week’s edition is a feature on Capt. Katie Petronio, an outspoken female captain who has made national news by blasting the concept that women should be allowed to serve in the infantry. In an interview at Marine Corps Base Quantico, Va., she discussed how her deployment to Afghanistan led to her her opposition to the idea, and what life has been like since her blunt piece in the July edition of the Marine Corps Gazette criticized it.